Because the technology makes traveling easier than it was hundreds years ago, today people fly from places to places to experience the different cultures in various countries. Vietnam, however, is one place that people think it is the place left in the world that is so close to the “reality.” Many destinations have not yet been explored by travelers. Vietnam is a bicycle-friendly country. Many people use bikes to commute in Vietnam. Bicycle travelers, Bill Fridl, Patrick Morris and David Foster chose their ways to discover the country. They cycled in Vietnam between 1995 and 2000. If you choose this method to sightsee in Vietnam, time can be the issue. Plan a trip with time flexibility to ensure a good quality trip. Cycling in Vietnam, time and energy are what you need. Knowing basic techniques to take care your bike would be a plus, and you can usually find some locals to help you with the bicycle problems. However, the language barrier could be a challenge. People who had traveled to Vietnam agreed that it was an interesting experience in general, but the bicycle tours definitely brought more adventurous excitements. There are two directions you can go. From north to south, you can visit Hanoi, Hue, Danang and Saigon (Ho Chi Minh City) in that order. Or choose the other way travel from south to north. You can fly to Saigon and bike to Danang, Hue and Hanoi. I figure that if I am biking from place to place, I don’t want to go back and forth. Additionally, I want to at least visit and spend some time at the four big cities in Vietnam. According to some experienced bicycling travelers, it will take about three weeks to finish the route, but it really depends on how much time you want to spend in these places as a tourist, meaning sightseeing and just hanging out to relax. The benefit and disadvantage of the bike tour is that you might feel the cultural shocks sooner than regular “tourists” because you are so close to the locals. Beginning from national capital Hanoi, a city called the “Paris of the Orient” because of the beautiful lakes and shaded streets. The beauty of the bike tour is that you can meet the locals and observe what they are doing every day. Friendly smiles, sunshine beaches and yummy food, they are all the amazing things to attract biker’s attention on the way to their next destination. While hanging out near Hanoi, Frenchtown, Ho Chi Minh Museum, Presidential Palace, Hoan Kiem Lake, Ngoc Son Temple are hot spots to visit. Hanoi is a historical town where visitors can find evidence of the history. Hearing so many people’s stories about visiting Hanoi, Bat Trang sounds like an attractive place. The town specializes in making large pottery and porcelain using traditional methods. The history dates back since the 16th century. This destination might not be everyone’s cup of tea, but I am usually attracted by the things like that. Besides, Bat Trang is located in the southeast of Hanoi about 17 kilometers away. Hue, known as one of the most beautiful cities in Vietnam, is the royal family’s former residence. Hue is also the heart of culture, religion and education. After days of biking, visiting the Thien Mu Pagoda is a peaceful journey. 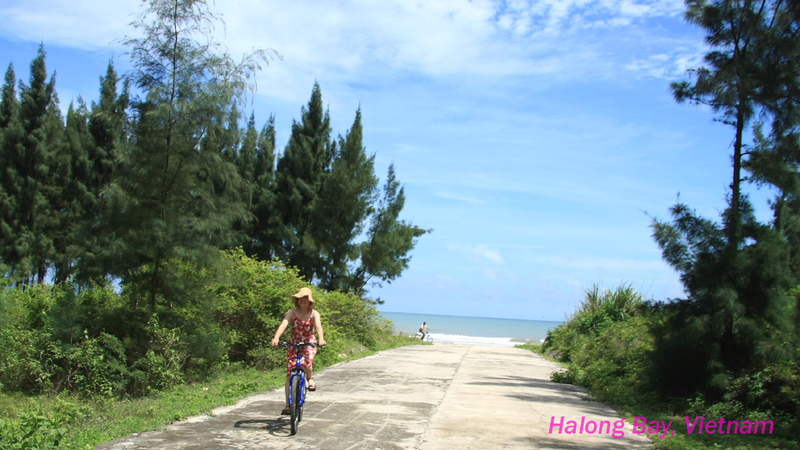 When you feel like a little bit of sunshine and salty water, the Thuan An Beach connects to the South China Sea and is about 13 kilometers from Hue. The beach has a protected lagoon. Although foreigners need to pay the fee to enter the area, it is still a popular location. Along the Perfum River (Huong Giang), there are many places to see such as Hon Chen Temple, Minh Mang Tomb and Gia Long Tomb. They are solemn locations with great masterpieces of architecture. Other things such as people’s activities on the streets and the view at the Trang Tien Bridge can also be appealing to visitors as well. Start from Hue and bike 108 kilometers south, you arrive at Danang. It might sound like a long way, but you will enjoy the view of Lang Co Beach and Hai Van Pass. In 1965, Danang became one of the biggest US military bases in Southeast Asia. The China Beach (Non Nuoc) is about 15 kilometers from Danang and about one kilometer away from the Marble Mountains. The beach is a popular surfing and swimming resort from March to August. Sponsored by the Vietnamese government and other various organizations, there is a surfing contest held in the area every year. Danang is also the third biggest city in Vietnam. Finally, you reach Saigon. The city had been through so many times of name changes. Today, it is known as the Ho Chi Minh City worldwide although not many Vietnamese use it. Saigon is probably the most famous city in Vietnam due to its frequent media exposure. In Saigon, I won’t miss the water puppet theater for the world. The show is only 20 to 30 minutes long. It is for the children’s entertainment, but it will please all ages. There are two fixed venues, History Museum and War Crimes Museum. It requires many difficult techniques to make a great water puppets show. There are also fixed venues for water puppet shows in Hanoi. Planning the trip, I would probably include the shows at the two cities and called it a Vietnam Water Puppet Tour. Some people think Saigon is a dangerous city because of the aggressive drivers, prostitutes, child beggars and other criminals. Experienced travelers recommend being aware of the bui doi (street kids). Vietnamese called them the dust of life. They sell random goods for a living and sometimes steal from tourists. Foreign bikers also think that it is the most confusing place to ride a bike. There are not many traffic lights in the district. Most of the roads seem to be one-way, but not many people follow the signs so be prepared for the chaotic situation. Today, the Internet is so convenient that there is so much information about traveling. Use the search engine leads you to many travelers’ unique stories.